Despite confession of criminal actions committed by him and his “coauthors” the CDC’s researcher, now legally protected whistleblower has not been subpoenaed by Congress. Let me put this in a very simple perspective for everyone out there. If a person were to confess to murder there would be an immediate arrest of that individual even if there was no evidence of the “confessor” to actually committing the murder. The police would arrest the individual because there is no greater evidence of guilt other than camera footage of the individual committing the crime. Well, a senior scientist working at the CDC has confessed to committing fraud and admitted he and his co-authors hid data showing the MMR vaccine was causing autism. If someone is confessing to committing a crime it’s highly unlikely they are then lying. This CDC scientist has confessed that he and others at the CDC conducting research on the connection between the MMR vaccine and autism had willfully attempted to destroy documents/data showing a “huge” causal association between the vaccine and autism. Yet despite this confession and Congress member being alerted to this fact, nothing has yet to be done. We must DEMAND a complete investigation in the full view of the public’s eye! While the country is divided on the vaccine issue we should all agree on a few things. 1. We should all agree that lies and fraud have no place in medicine. 2. We should all demand to know the truth in this matter as the lives of our children are at stake. One can not deny that a fully transparent investigation MUST happen and that our children and those already injured by the lies of the CDC deserve us all to demand that! 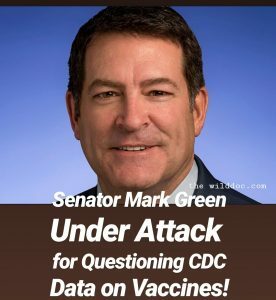 Town hall meeting after Mark Green was attacked on local media for questioning the legitimacy of CDC vaccine research.